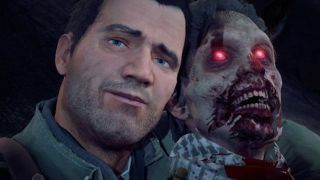 Like a zombie ripping the brains and entrails from its next victim, Dead Rising 4 is being torn away from Xbox One exclusivity and coming to PS4. Dead Rising 4: Frank's Big Package brings the base game, plus all DLC and an all-new mode to Sony's console on December 5 for $49.99. To recap, that means additional story content via the Frank Rising DLC, multiplayer via the Super Ultra Dead Rising 4 Mini Golf DLC, as well as all costumes and weapons from the Stocking Stuffer Holiday Pack, Street Fighter Outfit Pack, My Bloody Valentine Pack, Candy Cane Crossbow, Slicecycle, Sir-Ice-A-Lot, Ugly Winter Sweater, and X-Fists. The new mode is called Capcom Heroes. It lets you don even more costumes, as well as use special powers unique to the Capcom characters those costumes are based on. Capcom says there will be more than a dozen characters to choose from, including Sissel from Ghost Trick, X from the Mega Man series, and Cammy from Street Fighter (and yes, Frank can wear Cammy's signature thong). If you missed it the first time around, just know that Dead Rising 4 breaks away from many of the series' conventions. The panic-inducing timer system is gone, but so too are the well-defined Maniacs, and the save system is now far less punishing. It's a fun game, but one that may feel quite different to longtime fans. Or, as stated in our review, "This is a series finding its way back to what made it memorable, and there are going to be some growing pains." Well, better than 'having my flesh eaten' pains.